Heat the olive oil in a small non-stick frying pan over medium Heat. Do not allow it to smoke. Add the garlic and cook, stirring constantly, until it just begins to turn light brown, 1 to 2 minutes. Do not allow the garlic to burn, as it will make the sauce bitter. Add the remaining sauce ingredients accepted tomato paste, and stir well. Reduce the Heat and simmer the sauce until all of the liquid evaporates, about 10 minutes. Stir in the tomato paste and cook for an additional 2 minutes. Remove from the Heat and cool completely before using. Store covered in the refrigerator for up to 1 week. 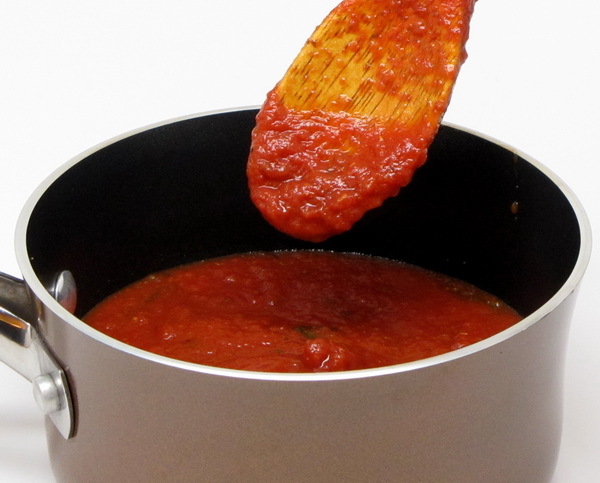 Spicy marinara sauce: double the amount of garlic and add 1/4 teaspoon crushed red pepper flakes along with it. Roughly chopped fresh basil leaves and stir into the sauce after adding the tomato paste.